Good location and Welknown Hotel ... The Hotel have under construction therefore they recommend and takecare us to stay at another hotel in that area (in the same roomrate). All 30 rooms of the hotel feature wooden floors, telephone, satellite TV, tea-making facilities, private bathroom with bathtub, hair dryer. Some feature large balconies with unrivalled views. Standard: 20 rooms with balcony, 12 rooms are street view and 8 rooms are mountain view; 24 m2. Superior: 6 rooms with fireplace & balcony facing mountain; 24 m2. Restaurant: the Friendly Cafe and Restaurant, with 80 seats and a spectacular mountain view from the terrace, has one of the most extensive menus in the Northwest of Vietnam and is an ideal place to enjoy your meal. The Exotic Bar and Royal Discotheque is the only one of its kind in Sa Pa, where you can relax, meet fellow travelers and local characters after experiencing the delights of Sa Pa and surroundings. The Valley View Bar, is the vantage point from which you can enjoy the views of the mountains, town and the beautiful valley of Sa Pa while sipping your favorite drinks. Services: Laundry, postal and parcel, travel desk, room service. Within 4 days of the arrival date , the room price will be charged 50%. Late cancellation within 2 days will be charged 1005 of room rate. Free charge for cancellation made more than 4 days before your arrival. It's in the centre of Sapa Town, near church, Sapa market. 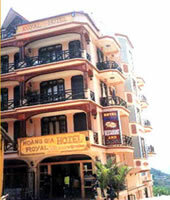 Nearest airport: 30km far from Lao Cai railway station.